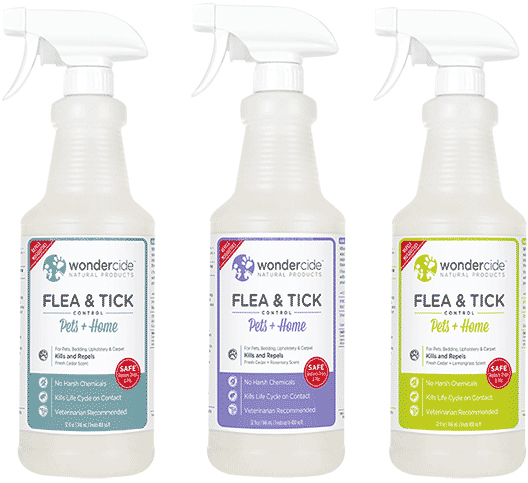 Do you want a Chemical-Free Solution to Fleas & Ticks? We carry Wondercide Sprays, Kin & Kind Spray and Shampoos, as well as Diatomaceous Earth to help combat these pesky critters. KILLS AND REPELS. A preventative and a treatment, this aromatherapeutic spray kills and repels fleas, ticks and mosquitoes. It kills the insect life cycle (adults, eggs and larvae) by contact and prevents pests from hitching a ride on your pet. REVITALIZING LEMONGRASS SCENT. Made with only the highest grade essential oils, this fresh lemongrass scent is invigorating and uplifting.